How are unconditioned and conditioned motivational states encoded and controlled? How do environmental cues acquire motivational power over reward seeking? How are individual differences in reward-related behaviors reflected in neural circuit activity patterns? What neural changes underlie shifts from normal to exaggerated motivational states that contribute to addiction and related diseases? We specialize in a variety of state-of-the-art techniques for mapping, controlling, and measuring the activity of neural circuits. These approaches are integrated with rodent behavior conditioning paradigms of natural (i.e., food) reward and drug seeking. 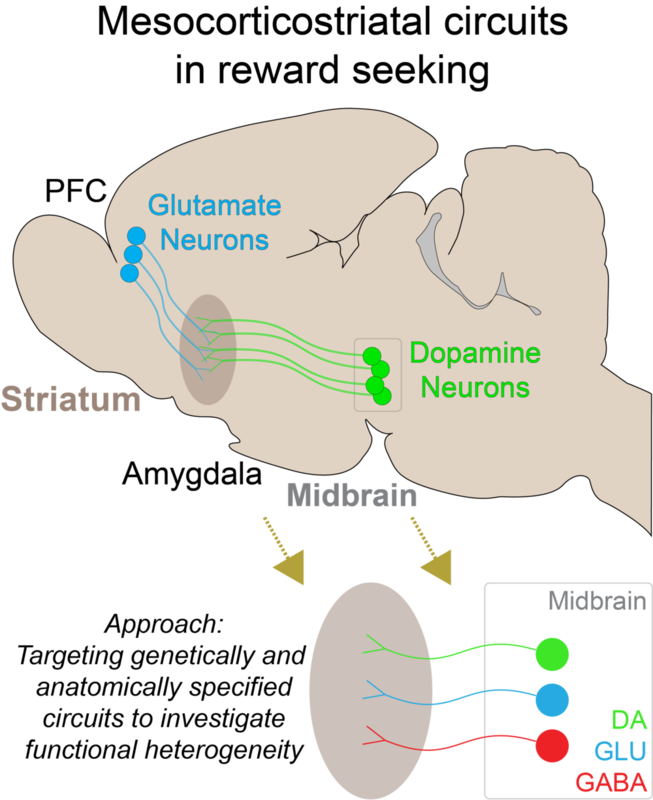 Dopamine neurons are critical for reward-related processes, but little is known about circuit-specific dopamine functions. In previous work, we found that distinct dopamine projections from the midbrain into the ventral or dorsal striatum conferred different motivational properties to Pavlovian cues. This resulted in divergent cue-evoked behavioral patterns, depending on which dopamine projections were engaged. Future studies in the lab will follow up on these findings, by probing dopamine neuron signaling dynamics in discrete sub-compartments of the striatum during Pavlovian cue conditioning, and how these signals change over the course of learning. Drug-associated cues serve a critical role in the maintenance of drug seeking, and contribute heavily to relapse. In previous work, we found that cocaine-associated cues acquire exaggerated motivational value during drug use, such that they can trigger relapse, even in the face of negative consequences. This process is partly controlled by dopamine signaling in the nucleus accumbens. Future studies in the lab will follow up on this work to characterize the circuit-level control of these processes, focusing initially on the role of midbrain and prefrontal cortical inputs to the striatum. We know very little about how distinct groups of neurons encode and control drug-related behaviors. 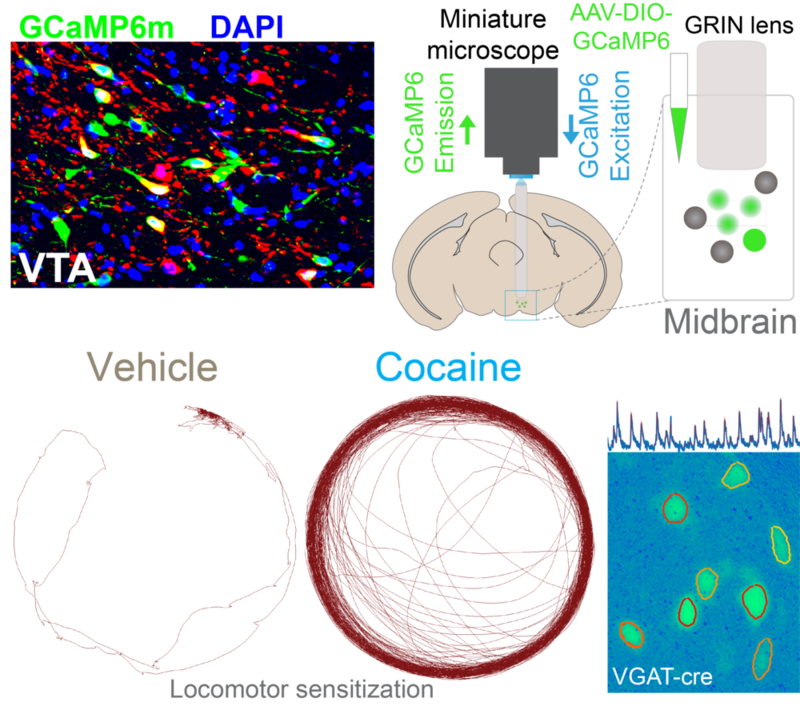 In current and future work, the lab will utilize miniature microscope calcium imaging methods to measure activity in defined neural circuits as animals experience drugs and drug-associated stimuli. Ultimately, the goal of these studies is to define a neural "code" the underlies maladaptive reward seeking in psychiatric diseases, like addiction. Initial studies will focus on characterizing the drug response patterns of different classes of neurons in the midbrain.